Hey guys we are back with another video. 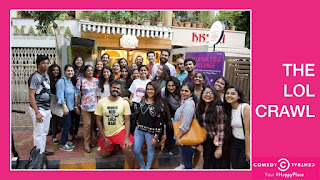 This time we were invited by EveryThingOnAPlate for a fun event organised by Comedy Central India "THE LOL CRAWL". India’s first happiness crawl across six of Bandra’s hippest spots. So this was a restaurant hopping event where we started off from Veranda, Bandra. After we done with registrations we got chance to play with cute puppies brought by Mitali Salvi. The puppies we super friendly specially the black pug. While enjoying the live music we had beetroot salad & palak bhendi chaat with mix berry mock-tail. After spending awesome time with adorable cute puppies we were off to our 1st pit-stop of the evening "Le-15 pâtisserie" for delicious macroons. After quick dessert stop we moved to next destination "Between Breads". Since we were the last batch of the event most of the non-veg burgers got over and we had to play a fun game to get a chicken burger. The game was simple say worst pick up lines and get a burger. While burgers getting ready we participated in marshmallow challenge. We had to stuff marshmallow into our mouth without chewing we have to say "Comedy Central is my happy place". And Kaustubh stuffed 7 marshmallows but it was tie. After munching burgers and playing marshmallow challenge we are on to next stop i.e. "bonobo Bar.Food.Love." for some mock-tail shots and helium balloon challenge. Inhaling helium and speaking was the most entertaining activity of this event. You guys can watch it at 6:28 minute mark. The last stop of the evening had a surprise, when we reached Monkey Bar we came to know that Punit Pania was going to perform a stand-up comedy show. The evening couldn't get better than this. The event was super fun, thanks to our captain Suhani Mardia. And we would like to thank Neha Rajadhyaksha of EveryThingOnAPlate for inviting us.